Spam averaged 67.6 percent of all emails in August, down 3.6 percentage points compared to July, wrote Kaspersky Lab analysts Tatyana Shcherbakova and Maria Vergelis in a blog post. But 5.6 percent of those spam emails contained malicious attachments, an increase of 3.4 percentage points over a month prior. The most prevalent malware program was "Trojan-Spy-html.Fraud.gen," which was in 8.1 percent of the emails containing malicious attachments. It's a very old piece of malware, first detected by Kaspersky Lab in 2004. The malware is lodged inside a bogus HTML page that imitates a registration form for banks or payment services. It asks a victim for account information or personal information, which is then sent to a hacker. The top 10 most common malicious attachments for August included four "ransomware" programs, which aim to extract money by locking victims' files or falsely warning they've been viewing illegal material. The ransomware programs block "the work of the operating system and display a banner that gives instructions on how to unblock the computer. For example, the user is told to send a text message with a specific text to a premium-rate number," the analysts wrote. Two other very old email worms, Bagle and Mydoom, also made the top 10. After infecting a computer, Bagle infiltrates a person's email contact list and sends itself out repeatedly. It was the third-most-common malware in August even though it was also discovered in 2004. Two variations of Mydoom took the eighth and tenth places. Like Bagle, Mydoom also collects email addresses from infected computers and emails itself. Phishing attacks rose tenfold, Kaspersky said, but still only amounted to a tiny fraction of overall spam, at .013 percent. 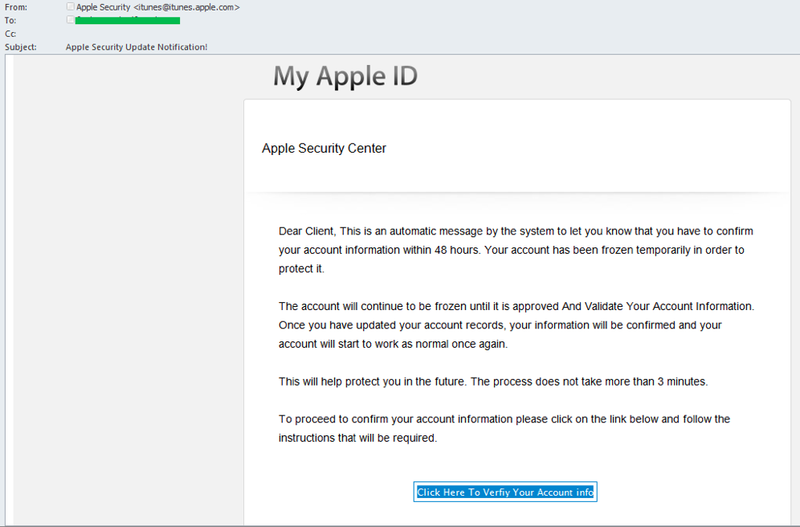 Apple was one of the main phishing targets. "We frequently came across emails that supposedly came from the official address of the company, but which in fact were phishing messages designed to deceive users and steal their logins and passwords," Kaspersky wrote. 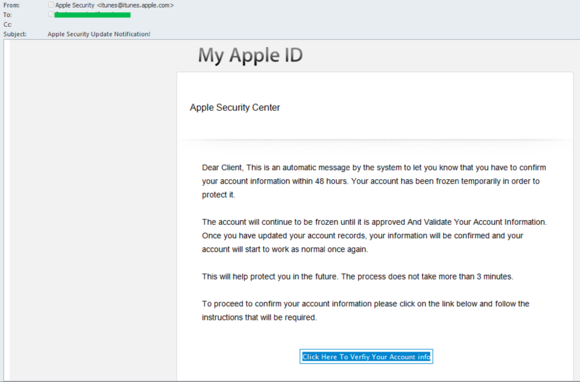 Some of the phishing emails, which purported to come from the "Apple Security Center," warned users that their accounts had been frozen and that they have 48 hours to confirm their details. Users are instructed to click on a link in the fraudulent email. "However, both the request to confirm the account information on third-party sites and the absence of a personal address should alert users to the risk of fraud," according to the post.